What a convenient way to eat or drink on your couch! This classic glass top snack table has sufficient space for you to place your snacks, drinks and even meals. Its black metal base provides sturdy support along with an elegant touch that will suit any decor. What a convenient way to eat or drink on your couch! This classic glass top snack table has sufficient space for you to place your snacks, drinks and even meals. Elegant touch that will suit any décor. Welcome this elegant accent table in a bold black finish that is both stylish and multi-functional into your home. Featuring a two tiered design in tempered glass to display either your favorite decorative pieces or a plant, along with pretty side scrolls design in metal will brighten any room and space. With its classy cappuccino marble-look top, this plant stand gives a warm feel to any room. Its original bronze metal base provides study support as well as an elegant look. Use this multi- functional table to place your favorite plant, or decorative piece. It will be a sure eye catcher! To have or not to have just isn't an option! This handy accent table offers individuals a simple yet favourable way for placing drinks, snacks or meals while watching TV or chatting on the sofa. Its fashionable curved chrome metal base and frosted tempered glass top provide exceptional support to this must-have piece! Add a contemporary appeal to your space with this matte black accent table. Its unique, connecting circle designed base definitely that accentuates this piece. Place a lamp, picture frame, plant or any decorative accent on this functional side table. In a rich black metal finish, it will be an eye catcher in any room. 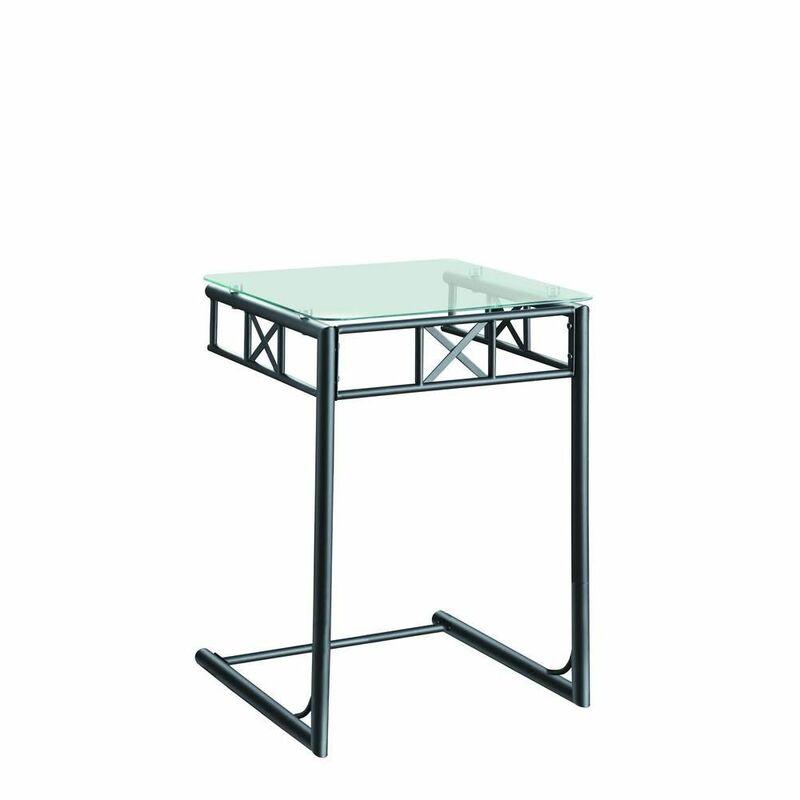 Accent Table - Black Metal With Tempered Glass What a convenient way to eat or drink on your couch! This classic glass top snack table has sufficient space for you to place your snacks, drinks and even meals. Its black metal base provides sturdy support along with an elegant touch that will suit any decor. Accent Table - Black Metal With Tempered Glass is rated 4.7 out of 5 by 3. Rated 5 out of 5 by Marsha from Beautiful !....But very time consuming to assemble...Had to have help....Wish... Beautiful !....But very time consuming to assemble...Had to have help....Wish HD had an assembly service!